I recently setup a PowerTap hub on my road bike and starting to figure it out. To help me along I also got a copy of the new Training and Racing With A Power Meter 2nd Edition. It’s pretty easy to just ride and see your power, but to actually make good use of your training time and new equipment, you need to understand your power levels or zones. 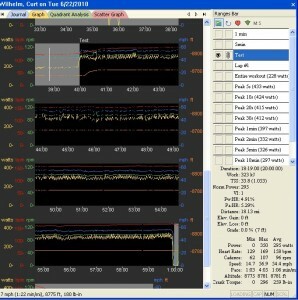 Power levels or zones are based off your Functional Threshold Power (FTP). This is similar to the Lactate Threshold Heart Rate, (LTHR). From these values you can develop workouts that will improve your strengths and weaknesses. The downside of using LTHR for training is that many different variables will effect your heart rate, the amount of sleep, hydration, fatigue, a cold, etc will limit your heart rate giving you false readings on your workout. Your perceived exertion may be 9, but your LTHR may be 70%, giving you a bad workout and making maters worse, maybe putting you into deeper fatigue. After a couple of rides to get an idea of my FTP and a good week of rest, I proceeded with a FTP test. The testing protocol looked like this. The last 20min effort is where you get your FTP. I used TrainingPeaks WKO+ 3.0 to get my avg power during the 20min duration. In my case the avg power was 295, with a max of 350. FTP is based off a 1hr effort, but since the test was only 20min, you can use the full value of the avg power. You must divide by 0.05, and subtract that number by the avg power. Like this: 295/.05=14.75 295-14,75=280. 280 is my FTP. I was also able to use my avg Heart Rate during test, so I can get my LTHR, which was 158. These values look really low, but the test was performed at 9200ft elevation, and will dramatically reduce the HR and power output. If I was at or below 5000ft, the HR and power would be 10-15% higher. Now that I have my FTP, I setup my Garmin Edge 500 to set my appropriate FTP zones. When I’m riding I can make sure that my scheduled workout is in the right zone.